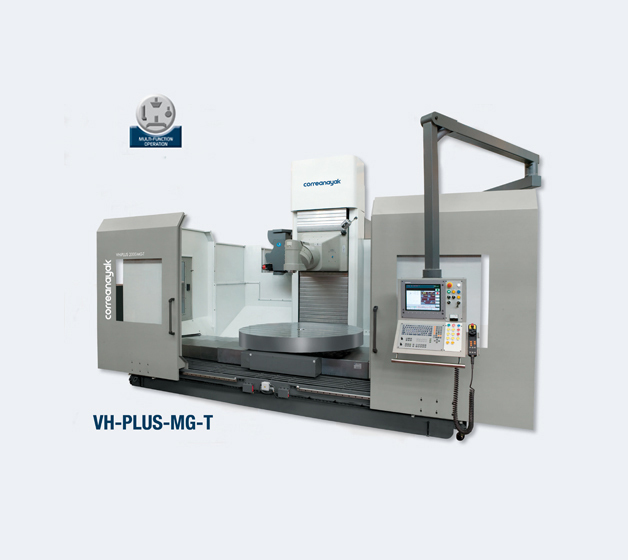 The fixed bed milling machine VH-PLUS is designed to machine medium-sized parts, between 2000 and 4000 mm. Furthermore, thanks to its T-shaped configuration it can have cross runs of up to 2500 mm. It offers excellent versatility together with highly dynamic features, at a very competitive price, backed by the quality, reliability and experience of Nicolas Correa. • "T shape" Multi-tasking Milling-Turning Bed Type Machine. • Turning Table Diameter 1900 mm. • X travel 3000 mm / Y travel (Cross) 1700 mm / Z travel (Vertical) 2000 mm. • Automatic Head Changer System. • Turning Head. Rotation every 2.5º with Taper Capto C8. • Universal Indexing Milling Head (Patented). Rotation every 0,02º, 6000 rpm with taper ISO 50. Heavy Duty Milling Machine able to perform any kind of milling operations as well as turning operations. Thanks to the head changer system, machine can mill or turn in optimum conditions.